We thought it important to inform coffee drinkers of what we consider one of the absolute best ways to address the office coffee issue. First I am informing you that we manufacture one of the products involved, but it is not necessary in order to achieve some of the benefits. My insights have evolved over the past 8 months. We first wanted to manufacture and sell an office coffee cart. This was pretty darn easy in that we already had a very nice stand that we only had to put wheels on. We wanted to use this first unit in our office, but there were issues with it. The power cord on our Bunn coffee maker was only 24 inches long, and the one on our microwave was only 36 inches. We were very limited on just exactly where we could put our new cart. 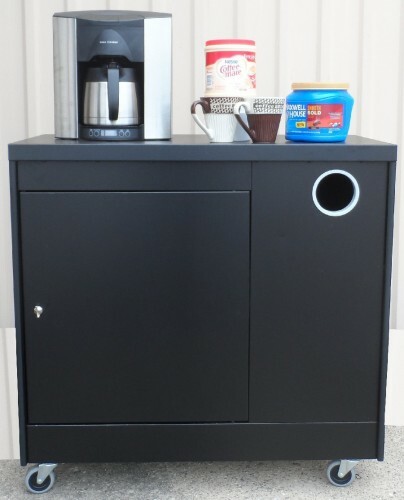 Since we already have electricity on many of our larger microwave/condiment stands, it was an easy choice to put it on our new “coffee cart”. Once completed, the All State Manufacturing Company’s OCC 36-ET became an extremely functional choice. It had a 4 compartment commercial condiment tray + 4 stainless steel utensil cups. We could keep our condiments and utensils readily available. Additionally, with the new electric service, we could leave our coffee maker and microwave plugged in and just plug the cart into the wall. The cord on the cart is 9 feet long, so we could place the cart just about anywhere. This very functional and versatile cart has already been in 3 different locations within our office areas, and is super easy to move again should the need arise. Once we started selling these carts, we received numerous compliments from our customers on how much they like the cart and how proud they were of it. Many of them have sent us photographs of the units all set-up and in use. For any normal company that would be the end of the story. However, at All State Mfg. we had one additional problem (opportunity) to address. Our water source, which is good ole chlorinated city water, was quite a distance off and in the storage closet of the men’s restroom. Needless to say it took a fair amount of time to fetch pretty bad water. We decided to attempt putting bottled water on our new cart. We had to make the door taller so a 5 gallon water bottle would fit without a lot of hassle. The door also had to be tall enough to allow room for a pump adapter on top of the bottle. The door changes to the cart forced us to give up our condiment and utensil storage. The water pump and adapter we eventually chose was a Flojet BW-4000, which we purchased from Amazon. The coffee maker we chose was a Brew Express ET-110 also from Amazon. The results were spectacular. All we need do is put in the coffee grounds and hit the button. 1 cup, 5 cups, or 10 cups, within a few minutes I am enjoying a fresh cup from bottled water. 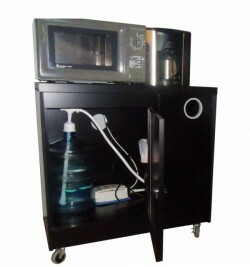 The entire setup is on locking casters and can be moved to any location very quickly. There is no water mess to clean up, and we even made room for a waste basket and an extra 5 gallon bottle of water in the cabinet. As of this point the All State Manufacturing Company’s OCC 36-WET with the Flojet BW4000 and the Brew Express BE-110 have all worked to perfection. It has been over 3 months since we put them into use. At about 20 cups per day we will just wait and see how long the coffee maker and the water pump will last. I hope to get about two years of service without encountering any malfunctions. Another plus for this set up, is that it is very easy to install everything. Take them out of the box fit things together and turn them on. Once we received the Brew Express and the Flojet the ladies in the office had everything unpacked installed and working in less than 15 minutes. If you like coffee, but not the fuss and mess, this is a great way to go. I just saw today that Brew Express has a new adapter for single cup pods. So there you go, and now you know. Any questions, you can call your local coffee vendor/provider, chances are they can help you out. If you don’t have a reliable provider in your area, call us and we will see if we can point you in the right direction.